Eden Hazard last week raised the hopes that he might be ready to sign a new Chelsea contract by suggesting to some of his team-mates that he expects to stay. But Chelsea are wary: the official line from the Belgian's camp is that he is yet to make up his mind on his future and is in no rush to commit past his deal, which expires in 2020. That caution looks particularly sensible after a first defeat of the season that raises fresh questions over whether Hazard will be able to realise all his ambitions at Stamford Bridge. Real Madrid are yet to make their summer intentions clear, and their struggles continued with a 3-0 defeat by Eibar, but Chelsea are a long way short of the level being set by Manchester City and Liverpool. Hazard wants to win trophies, and yet Saturday confirmed that he does not even play for the best team in London. That accolade goes to Tottenham Hotspur, who took apart Chelsea and frustrated Hazard by cutting off his supply line and isolating him. After Dele Alli had given Spurs an early lead, Hazard should have had a penalty, following a challenge by Juan Foyth, and he then cut an increasingly annoyed figure. His displeasure at being persistently fouled boiled over when he piled into the back of Ben Davies, after Harry Kane had doubled Tottenham's advantage, and received a yellow card. It was not just his opponents who appeared to get on the nerves of Hazard, who was offered little support by striker Alvaro Morata and would often look up to find the Spaniard had again strayed offside. 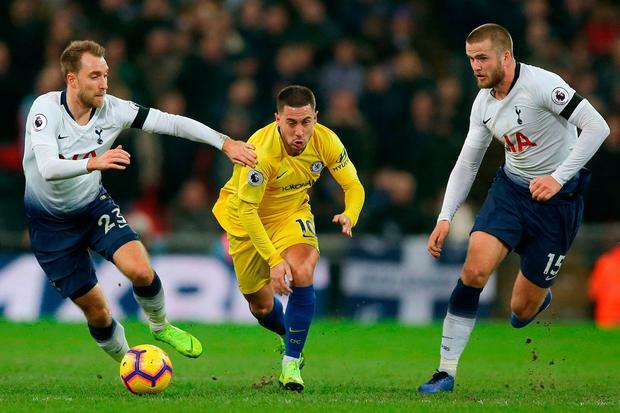 Head coach Maurizio Sarri even resorted to looking at Hazard in the false nine position, which the 27-year-old does not enjoy, but abandoned the experiment after less than 20 minutes, and Olivier Giroud went on to net Chelsea's goal. It is now five Chelsea games without a goal for Hazard and it will be a worry for Sarri that opponents appear to have cottoned on to the fact that the best way to stop him is to prevent Jorginho from getting the ball to his team's star man. Having seen Everton stifle Jorginho and Hazard, Tottenham manager Mauricio Pochettino gave Alli the job of marking the Italian international out of the game. A first defeat of the season at the end of November should not cause panic, yet the performance suggested that Sarri has some big decisions ahead of him. The 59-year-old is unlikely to deviate from having Jorginho at the base of his midfield, even if it nullifies the talent of N'Golo Kante, who looks uncomfortable in a more advanced role on the right. Pedro's smart double helped Chelsea ride out a worrying wobble to see off Slavia Prague 4-3 and reach the Europa League semi-finals. Nick Purewal Olivier Giroud has demanded a "more important role" in order to stay at Chelsea next season.